We all like to think we’re geniuses. Natural talents to whom our art comes as natural as breathing. We also all know better. Deep down, anyway. Deep, deep down. Sure, sometimes inspiration strikes and the words just flow and flow, unbidden, unplanned, at annoyingly inconvenient moments. But it is rare that those singular bursts of creativity yield a perfect, complete, finished work, be it fiction or otherwise. More often than not, these will be diamonds in the rough, parts of a greater whole, scenes, chapters, short stories or short films. And then begins the chore of fitting them within the larger narrative, of smoothing out the rough edges, rewriting, reworking, throwing bits away, grafting on new bits. Of figuring out what story you’re actually trying to tell. How much easier would it be, if we could figure that last bit out first: what is the story I’m trying to tell? What’s the basic idea, the basic premise, the main theme? How much easier would it be if we then thought about which characters the story needs, and how they change throughout that story? How much easier would it be if, perhaps from that basic idea of how the characters change, we could sketch out the basic shape of the story and its narrative spine? How much easier would it be if we figured out not just which sequences we need, but also how and where they fit in whichever story model we feel most comfortable with when writing? How much easier… Well, you get the idea. We’ve all heard the stories of genius writers who essentially write the first and final draft in a single sitting, without all that prep work. And they’re bull. Because those writers will have thought through all those different steps in their heads before putting a word on paper. That’s what makes them geniuses. Us mere mortals, of course, shouldn’t feel under pressure to do the same, we can cheat by using pen and paper and laptops and ipads to make notes and character bios and synopses and treatments and what not. But the point is that even the geniuses do the work and do the planning. All of this is not to say that you should never just dive in. I know plenty of writers who simply dive into the script with just a vague notion of theme, premise, character. But they do have that notion. And usually they dive right into writing a draft, because for them it’s the best way to discover who the characters are, or who the story is about, or what the story itself is actually about. And confession time: I’ve done it myself. Case in point is my first short film, Fall-Out. I was inspired and knocked out a first draft in a couple of hours, without much planning, simply letting the idea and characters take me where they wanted to take me. The idea was conceived from the simple practical premise: what story can I tell with two characters in one room? It led to an eminently pitchable story basis: it’s the end of the world and you’re locked in a bunker with your ex. Relatable horror, intrinsically dramatic and potentially funny. But though that first draft was okay, it ended up in the drawer, not coming out again years later, when I was dealing with the aftermath of getting rejected by EastEnders for a script editing gig (the first, but not the last time). I realised I needed something to showcase my storytelling talents, so I conceived of a series of interlinking shorts. Ambitious, but it got Fall-Out out of the drawer, along with the further realisation that not only did I need a better script, I also needed a plan. Rewriting it meant analysing it – luckily I have some experience with that – and essentially retro-actively planning the story. These were fun characters, in okay scenes, but it needed something more. The structure was a bit haphazard. The story needed to build. The characters needed to be funnier. I needed to figure out what story I was trying to tell in the first place. It would have helped if I’d planned it out, but then… the argument can be made that the first draft was that plan. Finally, there is another sense of planning that tends to help focus your writing: deadlines. 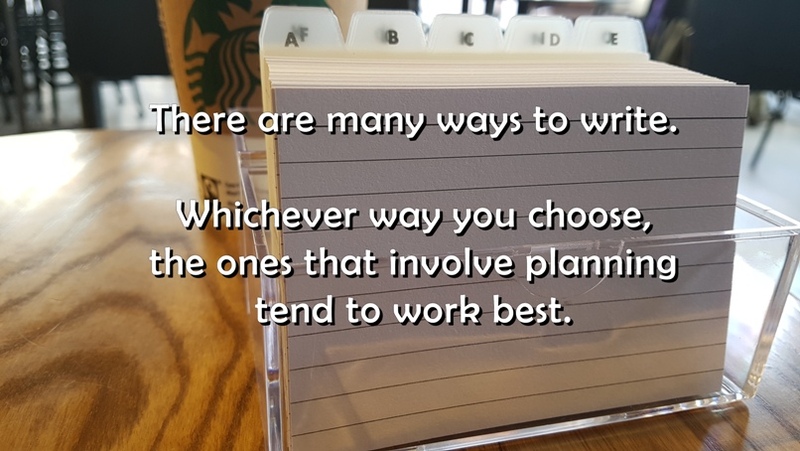 Setting yourself a schedule for when you want to finish a draft, especially when it’s not something you’ve been commissioned to write (which for most of us seems to be all that we write), gives you something to aim for. You can arbitrarily set a date, make promise to a friend who’s going to read your work, or if you’re brave enough aim for a submission window or a competition deadline.